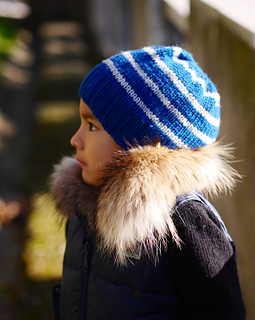 Nautica is a slouchy hat for all ages. Designed with a relaxed fit, it features deep rib and simple stripes. 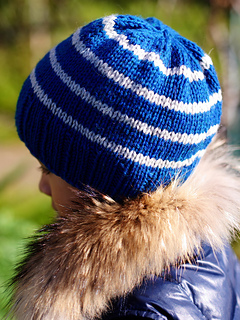 It comes in toddler, child and adult sizes, you can use this pattern for the whole family! The main body is worked in a smooth yarn and the stripes are worked in a rustic yarn to give textural contrast. 5.5 mm / US 9 circular needle of length 40 cm / 16”; adjust needle size if necessary to obtain gauge. 17 sts and 24 rows = 10 cm / 4” in Stockinette stitch, blocked.